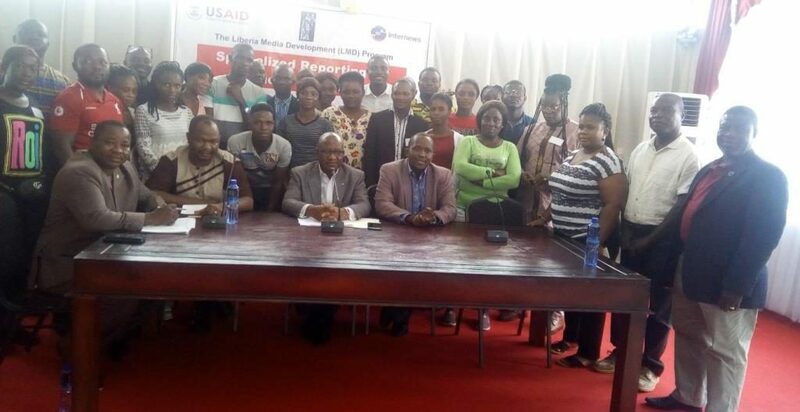 Participants, facilitators in a group photo with Chief Justice Francis S. Korkpor, Sr.
Monrovia – Internews in partnership with Liberia’s Judiciary has ended a week-long specialized judicial reporting training for journalists covering that branch of government. The training, which took place at the Temple of Justice in Monrovia, began on Monday, April 8 and ended on Saturday, April 13, 2019. It was funded by USAID. At the close of the training, 27 journalists were certificated for their participation. During the training, journalists were taught numerous topics including the role of the Judiciary in the context of the rule of law and national development, the court system, covering proceedings in the Supreme Court, Covering/Reporting civil litigation, covering/reporting criminal litigation, Ethics of reporting and application to court reporting, basic legal jargons, and writing legal story among others. Giving an overview of the training during the closing ceremony, the Director of Judicial Public Information Section Atty. Darryl Ambrose Nmah said the exercise has enhanced the skills of journalists to become effective judicial reporters. Director Nmah also added that the training has helped enlighten the minds of journalists about the “dos and don’ts” of the court system, and how to improve their reporting on the workings of the judiciary. “We are sure that coming here over the last five days and leaving from here, we can never say we are the same, but we have gained some knowledge,” Atty Nmah said. Also speaking on behalf of the Trial Judges Association, Judge Eva Mappy-Morgan admonished journalists to implement the knowledge gained from the training to be accurate, balanced and fair in their reporting. “We are very pleased that this type of training has ensued at the Judiciary. Judges, lawyers, reporters – we are all advocates for the truth. We are not adversaries, we do the same type of work, we hold people to their toes, we take the temperature of the society,” Judge Mappy-Morgan said. For his part, the Acting Chief of Party of Internews, Musitini Tawedzegwa said journalists have the mandate to report honestly, especially on judicial matters. Tawedzegwa also added that Judiciary issues are sensitive matters that should be reported with care and caution. “The development of a respectful media is in our DNA. 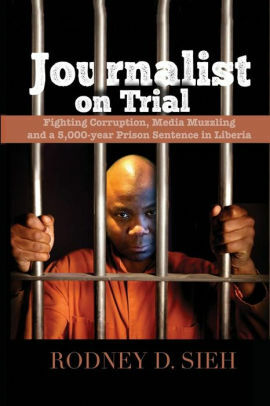 We are living during an era where the media is highly compromised worldwide, this is not only in Liberia but everywhere else,” the deputy Internews boss said. “Internews is committed to continuous and progressive collaboration with all of you, primarily for the betterment of the lives of the Liberian population at large. Judiciary issues are sensitive, and we believed that the result of this training we are going to see more improvement in the way judicial issues are reported”. Making remarks on behalf of the reporters, the President of the Association of Judicial Reporters (AJUR), Abednego Davies said thanked Interviews, USAID and the Judiciary branch of government for the initiative, adding that it will help improve the reporting of journalists covering the Judiciary. Journalist Davies also thanked the Chief Justice for providing office space for members of the Association (AJUR). “I want to say thank you for giving us the opportunity to improve our capacity as judicial reporters. It is because of the Chief justice interest that he attaches to us as journalists or to the profession that he was able to give us an office space where we now operate, and where this association was given birth,” he said.